Today I have called for everyone in the West End to make their voices heard on the proposed West End residents parking scheme. The City Council has today written to local residents seeking their views on the scheme. The map above gives some idea about the proposed area to be covered. It is clear that the availability of parking spaces in the West End and at times inconsiderate parking are major issues in the West End. 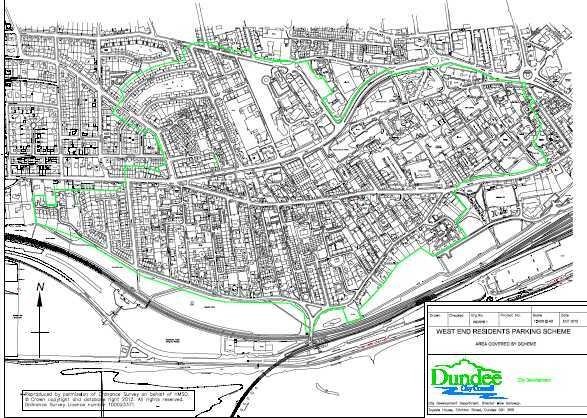 The council is proposing a residents parking scheme which would cost £80 per year and would allow parking in the area which is roughly from Blackness Avenue to the University of Dundee. If there is to be movement on this it is essential that everyone in the West End makes their voices heard and gives their view. I am disappointed that progress on this has taken so long but now that the formal consultation process is underway people must make their views known. Local people must be clear about whether they support these plans and the associated costs, noting that a residents parking scheme in Menzieshill costs £5. I am seeking a meeting with officers to make sure that every effort is being made to ensure that there is a high response rate to these proposals. I will also be writing to the City Development Department to ensure that businesses in the West End have their say over these proposals. As a local resident I am aware of the parking problems in the West End and I think that the council and local residents should be looking for ways to solve these problems. If the people of the West End believe that this is the way forward for them then we should move forward quickly on this, if not the council should move on and look at other measures to help deal with parking problems. Monday evening's Social Work and Health Committee saw the SNP Administration bring back a report on the closure of the Kemback Street Resource Centre and Out and About Support Service which they pushed through and which means that this service for adults with learning disabilities will now be closed. The committee heard from three deputations, firstly from George Stewart and Eileen Laing from the centre's action group, secondly from Moira Leck of Down's Syndrome Scotland and finally from Ian Hood of the Disability Alliance Scotland. These deputations in their own ways spoke eloquently, movingly and strongly against the proposals from the Administration. Mr Stewart and Mrs Laing were particularly strong on the impact these proposals have on the service users and their families. They also highlighted that despite claims to the contrary in the report that a number of service users had not been consulted on what services they will receive once Kemback Street closes. Neither the Convener nor the officers were able to prove that Mr Stewart or Mrs Laing were wrong in their assertion that not every service user knew what services they would receive. Indeed, the report claimed that only two service users were in this situation but in answer to questions this figure appeared to rise to four and then six. With this level of uncertainty and misinformation it was wrong for the report to even go before the committee in my opinion. Some of my colleagues asked why the Equality Impact Assessment was not available for the report presented on Monday evening. Eventually we were told that no new equality impact assessment was necessary since nothing had changed since a report to committee in January and an equality impact assessment carried out in December. This seems very unlikely to me, and clearly goes against a recent briefing for councillors on equalities from the council's equalities officer. I do wonder whether this would stand up to a legal challenge? I am worried that equalities are not being taken seriously enough by the Administration and by officers; we were dealing with a very vulnerable client group with this report and we did not take seriously the diverse impacts these changes will have on this client group. The report before us stated at paragraph 6.2 'An Equality Impact Assessment has been carried out and will be made available on the Council website ..' It is a pretty strange use of the English language to say 'will' and then when challenged say it was done in December of last year. But this is the report where 'reprovision' means 'close' and only 'close' not reconfigure or change as it might just be stretched to mean. I think on the basis of the deputations and on the basis of inconsistent and less than transparent report and answers from officers that this report should have been withdrawn, unfortunately a decision was taken to plough on regardless. I then spoke against the report, I started off by congratulating Councillor Jimmy Black on at least having the humanity to admit that the council could have done better in the way that the whole issue had been handled. I am in favour of the whole personalisation agenda; this is clearly where social work, and indeed other council services should be. But we cannot impose personalisation on people. For some of the service users from Kemback Street the service that they would choose for themselves would be the service at Kemback Street. Service users are clearly saying that they have not been properly consulted on this move. The Convener has told us time after time that this policy is not about saving money. If it not about saving money them there is no reason why the policy should have been forced through. Although I do see references to £766,000 in the report. We should have stopped the process here; we should have a full consultation about what is really being proposed. As the Administration were not prepared to do that then I fear that the unavoidable conclusion is that this is all about money and that this is a saving. I congratulate the parents, carers and service users from Kemback Street who have with great dignity made their points and stood up for what they believed was good for their families. It is a sad day for this committee if all of us did not listen to them this evening. Unfortunately, every member of the Administration voted through these proposals and every other councillor voted against which meant that the report was agreed. I hope that service users and their families will find a service which suits them but I remain very disappointed about the manner in which this report was pushed through. I was very pleased that at last night's meeting of Dundee City Council that the Lord Provost opened the meeting by paying tribute to the late Michael Marra. This was a very nice touch from the Lord Provost and I could only agree with him that 'Michael's songs will live on as will his memory.' On behalf of the Labour Group I paid tribute to Dundee's 'bard'. I also pointed out that this might well be a great loss to the artistic community but it is more importantly a great loss to his family. I also said that I thought that it would be appropriate for there to be a lasting memorial to Michael Marra in the city of Dundee. I noted that the Marra family have set up a trust in his memory and that they would like to see the El Sistema project come to Dundee. This would be a fitting tribute in my opinion. It was more than appropriate that the City Council concluded its tribute with a round of applause for someone who has written and sang so eloquently about our city.